The last time I wrote about the problem with making economic growth a national goal, it was February 2013 and Obama was president. It seems sooo long ago. EcoOptimism is a bit obsessed with the concept of growth (here and here, as well as the link above) and its misplaced and misleading focus on Gross Domestic Product. It‘s a contender for the most frequent topic here, up there with “win-win-win,” which is the essence of EcoOptimism. In one of the other posts on this topic, I wrote that a major problem with economists’ and, especially, politicians’ attachment to the supposed necessity of growth – and particularly growth as measured by GDP – is the attractiveness of the word itself. Who can argue with growth? Who can oppose it and survive attack? So I looked at ways to get around this by using a different word – a word or phrase that sounded as positive and appealing as growth. I mentioned “post-growth” as a phrase that many growth critics favor. I suggested “regrowth.” I brought up a less familiar term, “plenitude,” employed by Juliet Schor in her book by the same title. While reading yet another book that criticizes focusing on conventional economic growth, I started getting worked up about a new way of putting it: “real growth.” Aside from its simplicity, its strength is that it makes conventional growth sound the opposite of real. But from there, I jumped to thinking about things unreal and, in our current political climate, the word “fake” seemed an obvious synonym. I’ve been, shall we say, annoyed about the co-opting of the phrase “fake news.” It was originally used, back in the beginning of the campaign we wish we could forget, to refer to social media posts that we now know were planted by Russia and had a major influence on the election. But somehow, in an example of brilliant PR, the phrase got adopted by the right wing and by the man I’ve referred to as SCROTUS (so-called ruler of the United States) to malign any news they didn’t like. So, much as I hate that, I have to admire its success. So I hereby propose, using all the powers vested in me, this combination of terms: real growth vs fake growth. 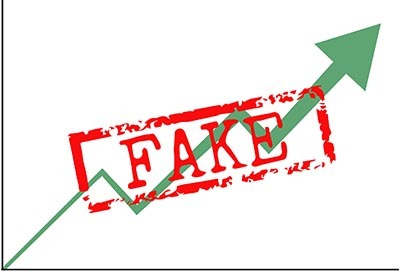 Can “fake growth” make the point? Can it provide the sound bite in a social media world, where other terms haven’t? This entry was posted in Economics, Messaging, Policy, Politics and tagged consumption, GDP, growth-economic on March 23, 2018 by David Bergman.